Bankruptcy history is not hard to reconstruct. The European statutes are easy to find in any law library. The hard part is to find data on the individual debtors involved in a these cases. Who were they? Why were they bankrupt? What is the procedural history of a particular case? By chance, I had the opportunity to open a door through time and observe part of a bankruptcy case from 1771. Bankruptcy History in Old England, and a meeting of creditors held in a tavern. At the Turks head tavern Gerrard Street Soho February 12th.1771. WHEREAS an advertisement was Inserted in the London Gazette on Tuesday the fifth day of this instant February desiring the Creditors who have proved their debts under a Commission of Bankruptcy awarded and forced William Weston late of the parish of Saint mary lebone in the County of Middlesex Carpenter Dealer and Chapman to meet the assignees of the said Bankrupts Estate… (emphisis added). Dated February 12, 1771, it is a memorandum signed by the creditors who attended the meeting of creditors at the Turk’s Head Tavern. (Unlike old English indentures, this document is short and easy to read. My first impression was, WOW. This is bankruptcy history coming alive. I am not a genealogist nor professional historian. But from my computer, I set out to learn what I could about the bankruptcy history of this case and the people involved in it. This bankruptcy case took place almost 250 years ago. I had low expectations of finding anything. I found out that the term “Chapman” is a Middle English word meaning a peddlar, dealer or merchant. In Old English it is cēapman : cēap, trade. ; The Merrium Webster Dictionary . That is where the word “cheap” is derived. Referring back to the Memo, this means William was a carpenter who was engaged in business. As you will see, it turns out that William was more than a carpenter. Today, we would call him a contractor and a developer. I made an Internet search using this information and found a fascinating little footprint from William’s life prior to bankruptcy. William Weston does construction projects for very important clients. 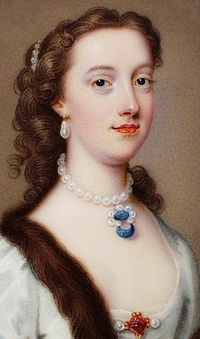 Margaret Cavendish Bentinck, Duchess of Portland (11 February 1715 – 17 July 1785). According to her Wikipedia page, she was the richest woman of her day in Britain. She is remembered for establishing a personal museum, (open to the public). Her museum had the finest natural history collection of it’s day and priceless art objects. One such object was an ancient Roman vase. The vase had been commissioned and owned by none other than Augustus Caesar. Margaret is also the great-great-great-great grandmother of Queen Elizabeth II. Margaret was the beneficiary of a trust which owned the land referred to in the indenture. The creditors agreed that the “assignee” of the estate, (akin to a trustee of today), was authorized to collect the bankrupt’s estate and if necessary, to “bring suits in equity” or “submitting to arbitration.” Isn’t it interesting that the document contains a reference to arbitration? (I had no idea that arbitration existed at that time.) Just as today, the estate of the bankrupt consisted of accounts receivable owed to the bankrupt. As noted below, there was at least one debt owed to William. An interesting point of procedure is set out in the Memo. It is the “bringing of suits in equity.” Suits in equity are tried without a jury. That procedure must have been a handicap to defendants when being sued by a bankruptcy assignee. (Perhaps this was the grandfather of “jurisdiction by ambush” as we had under our own United States Bankruptcy Act of 1898?) The assignee was also authorized under the Memo to defend suits that might arise “from the same.” Thus a cross-complaint would be defended by the assignee. The document discuses with particularity a dispute between William and “Sir Charles Knowles Baronet.” The dispute concerned a “debt claimed to be due from the said Sir Charles…” It is specified that this dispute will be referred only to arbitration, (thus no lawsuit). Why that would be? Probably Sir Charles was powerful and politically well connected? Could it be that a privately held arbitration was politically advisable in this instance rather than a public lawsuit? Let’s meet Sir Charles and decide for ourselves. The Memo shows that William did work for Sir Charles Knowles, Baronet, (pictured to the left). It was not hard finding out who Sir Charles was, (c.1704 – 9 December 1777). He has his own Wikipedia page, and was a distinguished man of importance. He found fame and fortune in the Royal Navy, rising to high rank and saw considerable service in many wars of the period, including the War of Jenkins’ Ear. The London Gazette was the Bankruptcy Reporter of that time. When looking for bankruptcy history, the London Gazette is a fertile field. The London Gazette, in their own words, is “Britain’s oldest continuously-published newspaper.” The paper is alive and well. It’s archives are full of bankruptcy history. In a brief diary entry from the 17th Century, the eminent diarist and public servant Samuel Pepys noted publication of the London Gazette’s first issue. By the early eighteenth Century the Admiralty and War Office published dispatches in the Gazette and submitted details of the appointments and promotions of their officers, a process continuing even today and known as “being gazetted.” In 1712, an “Act to Relieve Insolvent Debtors” required the publication of insolvency announcements. The publication of bankruptcy notices soon became a staple of the Gazette’s business. Our bankruptcy document states, “WHEREAS an advertisement was Inserted in the London Gazette on Tuesday the fifth day of this instant February desiring the Creditors who have proved their debts.” An archive containing almost every edition of The London Gazette exists on the Internet. It is searchable, and a treasure trove for researchers. So, why not find that ancient issue from …Tuesday the fifth day of this instant February…? Just as our bankruptcy document said there would be, there is an edition of the London Gazette covering Tuesday, February 5th 1771. My excitement turned to puzzlement. That edition carries no mention of William Weston’s bankruptcy. How would that be? Is the Memo a fraud? * More digging. Then I had it. William’s bankruptcy notice appeared in the February 1st, 1771 edition of the paper. Whoever scribbed the bankruptcy Memo made a mistake. The writer had written the wrong publication date. William’s bankruptcy turns up again on the pages of the London Gazette one year later, on February 1st, 1772. The announcement states that creditors intend to meet again at 4 o’clock in the afternoon at Guildhall, London to make a dividend of the said Bankrupt’s estate. See, http://www.london-gazette.co.uk/issues/11204/pages/4 Gazette Issue 11204 published on the 10 December 1771. Page 4 of 4 to meet jan 7th. Why was a bankruptcy meeting held at the ‘Turks Head Tavern on Gerrard Street, Soho’? The Turks Head Tavern of that day was an an important meeting house. It was the hangout of important literary figures of the day, including the likes of Edmund Burke and Oliver Goldsmith. 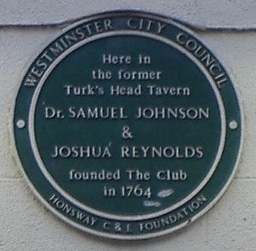 It was at the “Turk’s Head,” at the corner of Greek Streetand Compton Street, and afterwards in Gerrard Street, that the Literary Club—sometimes alsocalled “The Club”—was founded in 1764 by Dr.Johnson and Sir Joshua Reynolds. The “Turk’sHead” had already a reputation of its own, having been a kind of head-quarters for the Loyal Association during the Scottish rising of 1745. “The members,” says Mr. Peter Cunningham, “met one evening in every week, at seven, for supper, and generally continued their conversation till a late hour.” Sir John Hawkins, Burke, and Goldsmith were among its original members, the latter being admitted in spite of Sir John Hawkins’ objection to”Goldy” as a mere literary drudge. From: ‘Soho’, Old and New London: Volume 3 (1878), pp. 173-184. URL: http://www.british-history.ac.uk/report.aspx?compid=45145 Date accessed: 05 November 2013. (The photos at left are the site today of the old Turks Head Tavern in Soho where William Weston’s meeting of creditor’s was held. 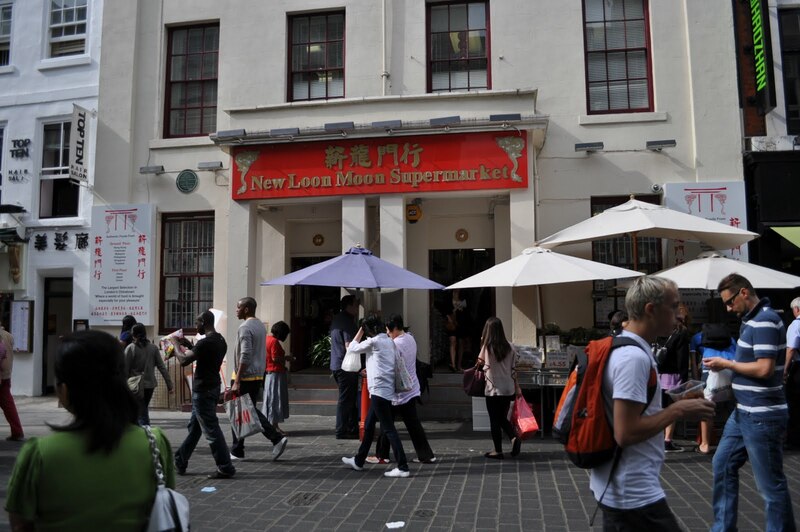 It is now a Chinese Restaurant, and the area is now referred to as Chinatown. There is a round plaque commemorating the Tavern attached to the front of the building. What happened in William’s life after bankruptcy? Sadly, that I do not know. I’m still looking for what finally happened to William Weston late of the parish of Saint mary lebone in the County of Middlesex Carpenter Dealer and Chapman. I have not yet found any further record of his personal bankruptcy history. I am also looking for information concerning the three individual creditors who signed the Memo. William’s personal bankruptcy history is fascinating. When time permits, I’ll try to resume the search. Previous articleLos Angeles Bankruptcy Helper Hits 200!